When you go to buy a car, you might find that your auto lender classifies you as a high-risk borrower. This can happen for a number of reasons, but the impact is the same. You'll probably get a less attractive loan offer with a higher rate, a shorter term or more of a down payment required. If you're in this situation, there are ways that you can reduce your risk profile and get a better loan. Being a high-risk borrower usually comes from one of two factors -- you either have a low credit score or you're so new to credit that you don't have a score at all. Depending on the lender, you could end up being classified as a sub-prime borrower, which is the industry's term for high-risk customers, if your credit score falls below either 620 or 680. Not having a credit score could also make you a high-risk borrower. 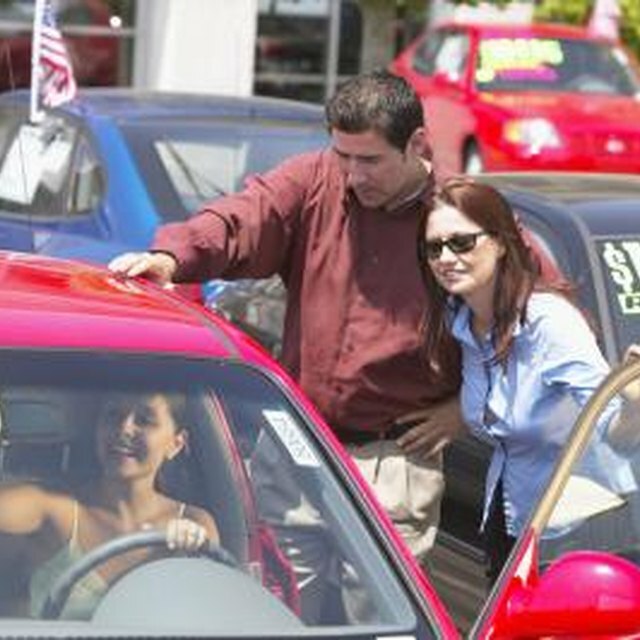 As of October 2013, the national average rate for a 60-month new or used car loan was 2.96 and 2.63 percent, respectively, according to Bankrate. These rates are available to well-qualified customers. For comparison, the average interest rate on a 72-month subprime loan was around 14 percent for most of the first part of 2013. While a $20,000 five-year loan at 2.96 percent carries a $359.02 monthly payment, a $20,000 six-year loan at a 14-percent rate costs $412.11, even though it's a year longer. A 12-percent, five-year loan would cost $444.89, for comparison. If you think you might fall into a high-risk category, the first step is to pull your own credit and find out what your situation actually is. Knowing your score will let you know what the lender knows and give you a chance to fix any errors. If you get your report from the credit agency, it will frequently have an online dispute process that you can use to correct bad information. Once you know your credit profile, it's also wise to shop around. Different lenders look at risk differently, so finding the right one can save you money. How High Does My Credit Score Need to Be to Buy a Car? If it looks like there's no way around a high-risk loan for you, there are three additional ways that you can potentially get a better rate. If you are a new college graduate and buying a new car, talk to your dealer about the auto manufacturer's new grad program. Sometimes, these programs offer better finance rates by overlooking the fact that you don't have a lot of credit history. Many also offer additional rebates. Another potential solution is to put more money down since the more you put down on your car, the less the bank has to lend and the less risk it takes. You can also bring in a cosigner with good credit. The cosigner's credit will be considered and could cancel yours out. CarsDirect: What Is a Good Car Loan Credit Score? Autobytel: What Is Tier 1/2/3 Credit?